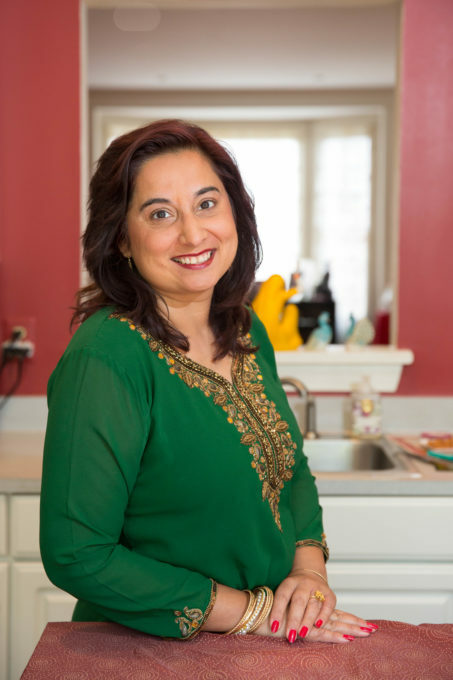 My super talented friend Alison Stein has created a wonderful line of hand-made jewelry called The Due East Collection to pair with Karma and the Art of Butter Chicken! In fact, one of her pieces is a specific ode to the the book. 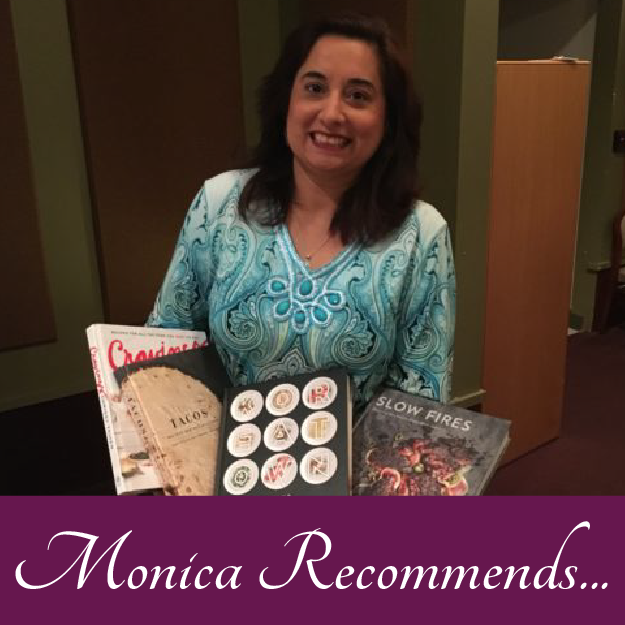 The jewelry is a terrific buy for the holidays and a great way to pair Karma and the Art of Butter Chicken with a beautiful piece of art! This is Alison’s first foray in jewelry making and I just adore her work. Tell me about your wonderful Due East Collection. 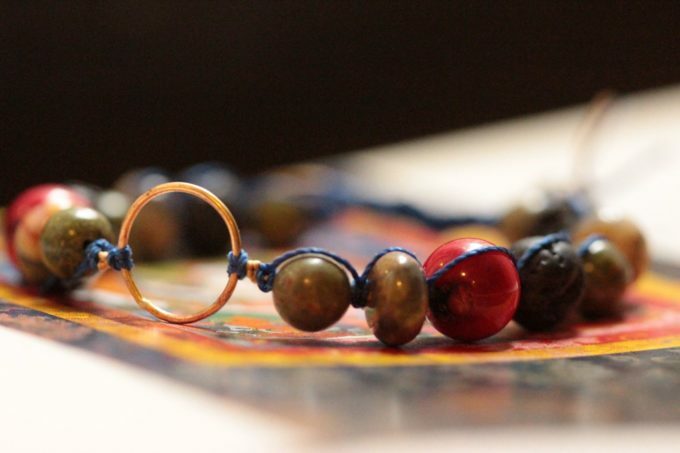 The Due East collection is my appreciation of eastern philosophy. Growing up in the 1980s, it was a part of my New York City public school education — although it’s safe to say a lot flew over my head. I was assigned Herman Hesse’s Siddhartha in the seventh grade, and was puzzled by how the story began in a palace, instead of ending in one; I took yoga as a daily gym option in eleventh grade and relished the days devoted to savasana, which we all called “sleep.” I got more informed as I grew older, reading Pema Chodron, Thich Nhat Hanh, Sylvia Boorstein — and while my approach is still more armchair than adherent, I have been amazed at how often the wisdom and practices have been a source of strength and comfort to me.There is a tradition of religious jewelry in the East, and these bracelets are not that, although I did try to incorporate my understanding of Buddhist art philisohy and symbolism. In Tibetan Buddhism, the arts are a part of spiritual practice. “Form is a way to the sublime,” writes Anjan Chakraverty, in his book Sacred Buddhist Painting. Tibetans were advised to commission a painting to remove physical or mental obstacles, and paintings and sculptures were seen as evocations, arrived at through meditation. How did you decide on the design for bracelets to go with this book? I know you have two different designs. Can you tell us about both of them? I borrowed this approach for these bracelets and started with a question in mind about the idea of karma. Karma is often misunderstood in the West as a system of punishment and reward, but as I was making these bracelets, I thought of karma in two ways: that our every action should be mindful and intentional, and that all of our karma is intertwined with others, often in ways we don’t see or understand.So, the brass circle (sometimes called a karma circle) is a representation of the outside of a wheel, an important symbol in Buddhism. Each part of the wheel has meaning; the rim signifies focus and concentration. I tied Chinese cord and gold silk into knots that hold the bracelet together. 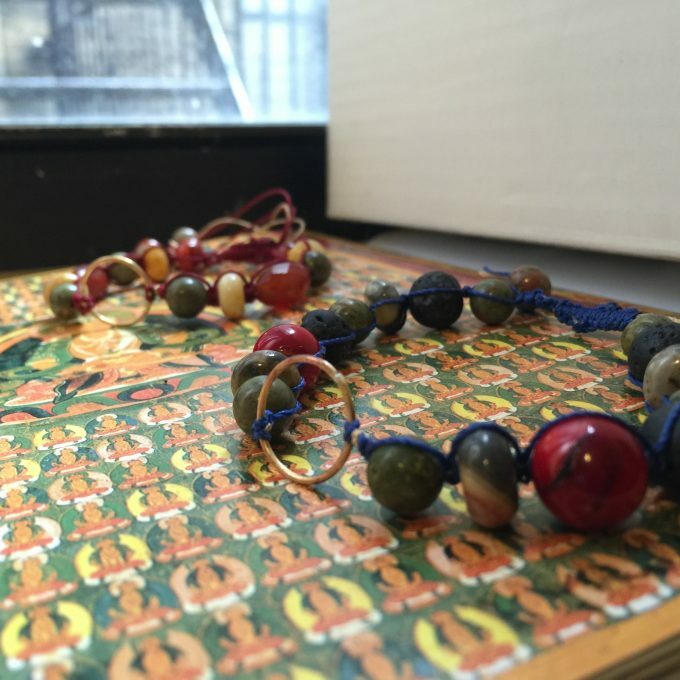 These signify the sinewy web of twisting connections that bind us to one another.I selected natural stones using a color palette inspired by Tibetan Buddhist paintings. 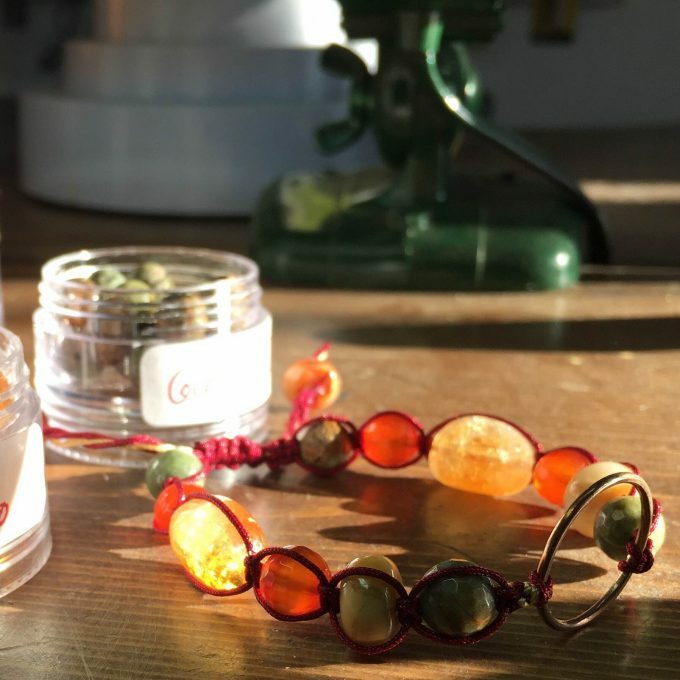 The first bracelet is smaller and more feminine and features fire agate, crazy agate (so called for its variety of colors), carnelian and a type of jasper stone called unakite.The second is larger, more masculine and has natural coral, lava, crazy agate and unakite.Both have adjustable clasps — simply slide to open, and pull on the cords to close. The feminine version will fit a variety of wrist sizes in the range of seven inches, the masculine version will fit a wrist sizes in the range of eight inches. The karma circle starts out as a piece of brass wire, which I cut off a big coil, straighten it and then shape it into a circle on a mandrel. I take it over to my torch station, and use silver solder to secure it. (I generally make several bracelets at one time so I make a lot of circles and set them aside.) The heat turns the metal black, so I pickle them in a mild acid bath and then sand and slightly polish. The rest of the bracelet is assembled with square knots, mostly. It’s again taking a straight raw material, in this case the cording, and shaping into something new. I love knotting, it’s very meditative. I almost can’t consciously explain how I make each knot — the knowledge is in my muscle memory. I load up all the stones onto the cord before I start knotting, so that’s when I make all the final decisions about which stones, which order. I work on one side of the bracelet at a time, so I select the stones for the other side of the bracelet and set them aside. The time passes very fast when I’m making these. Where can people buy your wonderful jewelry? Bio: Alison Wonderland Jewelry makes art jewelry for word people, and word jewelry for art people. If you care about language, and you like beautiful art objects — or you need a gift for someone who does — welcome to your jewelry home. Every piece of Alison Wonderland Jewelry is designed and handmade by Alison Stein, in her Greenpoint, Brooklyn studio. A lifelong New Yorker, Stein spent a very long long time making a living as a writer and freelance journalist. This might have made her a little cynical, but it also definitely sharpened her eye for life’s many ironies. She brings a narrative sensibility to her jewelry. Note: I dont have any financial stake in this jewelry! I do have a strong spiritual stake! I adore Alison and her work! !